“Black and White” - a story of an era of two colours. The golden era of Hindi Cinema - which “painted” its screen with the best of poetry and music. An era when life was simple and simple means were needed for a happy life. There was contentment in small things and life was a melody. Our cinema then reflected those times. “Black and White” travels through life of cinema from 1945 to 1968. The journey visits landmarks like K.L Saigal, Bimal Roy, V. Shantaram, and Guru Dutt. En route, we meet the stylish Dev Anand, tragedy king Dilip Kumar, showman Raj Kapoor, the beautiful Madhubala, the classy Meena Kumari, and “Yahoo” Shammi Kapoor, to name a few. “Black and White” is a collage of performance on screen and stage. Aided by mega screen audio-visuals, the performers on stage blend with the celluloid, making music come alive on stage. The presentation format is reminiscent of a stage musical where the singers “act” the characters. The performance touches the finer aspects of the era through the medium of music, pictures, movie clips, anecdotes and trivia. “Black and White” is an attempt to give a third dimension to the celluloid screen, restore links with our past, get nostalgic and go back to our roots, to those moments which we all want to relive. 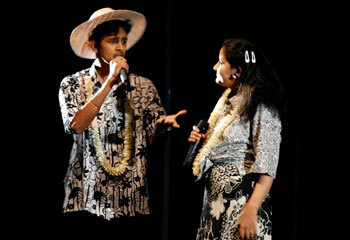 Singers : Hrishikesh Ranade,Vibhawari Apte, Jitendra Abhyankar, Swarada Gokhale/Savani Ravindra. Till date in less than 2 years we have performed 200 shows including 28 in USA, 14 in UK, 1 in Dubai and 1 in Muscat. In India, this show has been performed in Pune, Mumbai, Delhi, Chennai, Jaipur, Bangalore, Surat, Nagpur, Jalgaon, Sangli, Kolhapur, Aurangabad, Nasik and Kolkata. All the shows have been a tremendous success. We have launched a new show - Black & White II - with the new set of songs of the same era.